Welcome to our multimedia exhibition exploring T-shirts as canvasses for meditation on contemporary identities. Originally inspired by Shmattes, a traveling t-shirt exhibit that explores Jewish cultural identity in contemporary America, this website is a collaboration between professor Ari Y. Kelman, documentarian Sam Ball of Citizen Film and a team of designers, mediamakers and scholars, including Ari’s students at Stanford University. We invite you to contribute to this exhibition too! 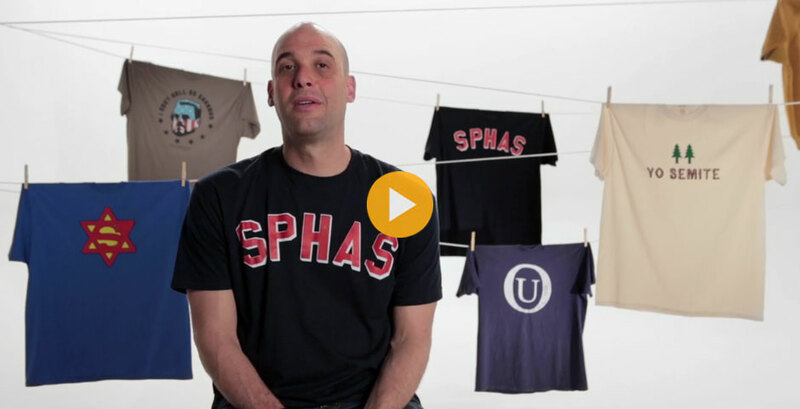 Please consider taking a picture of your favorite t-shirt, and posting a brief statement about what you think of the shirt, or how it communicates with people who encounter you. Your shirt will be added to our #ethnicteeshirts Instagram feed and may be curated into a multimedia exhibit on display in the Contemporary Jewish Museum San Francisco store. Over the coming months, we’ll be developing this website, as well as other physical installations exploring how we create, define and express our identities on our shirts. This is a work in progress. View t-shirt exhibitions by students from the Stanford University course, “Curating Experience” from Winter Quarter, 2015. A select group of students will receive a $250 honorarium for posting an exhibition. For more information, email admin@citizenfilm.org. What Does Your Shirt Say? 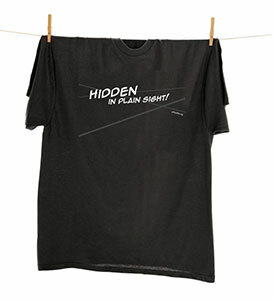 Hidden in Plain Sight is a collaborative project that engages with t-shirts and their meanings in several ways, including a seminar at Stanford University, a physical installation at the Contemporary Jewish Museum SF (7.23.15 – 11.01.15), and this website. This new media project was incubated in the New Media in Jewish Studies Collaborative, launched by Citizen Film in partnership with Columbia University’s Institute for Israel and Jewish Studies. The partners behind this project will be displaying more shirts over the coming months. Starting July 23, 2015, visit our physical multimedia exhibition in the Contemporary Jewish Museum SF store, curated by Ari Y. Kelman and Sam Ball. Email admin@citizenfilm.org to learn about upcoming events, including “Yo Semite!” at the CJM and the Shmattes installation at the University of Virginia (Charlottesville), curated by Anne Grant. © 2015 Citizen Film. “Yo Semite!” exhibition co-created for the Contemporary Jewish Museum by Ari Kelman, Jim Joseph Chair in Education and Jewish Studies at Stanford University; and Sam Ball, co-director, Citizen Film. Contact admin@citizenfilm.org for additional information. See credits and additional info about shirts.